University of Maine professor of insect ecology Frank Drummond (left), research scientist Jennifer Lund (right) and graduate student Beth Choate (obscured) check a beehive while collecting samples of bees from hives that are observed as a study in Stockton Springs in April 2009. 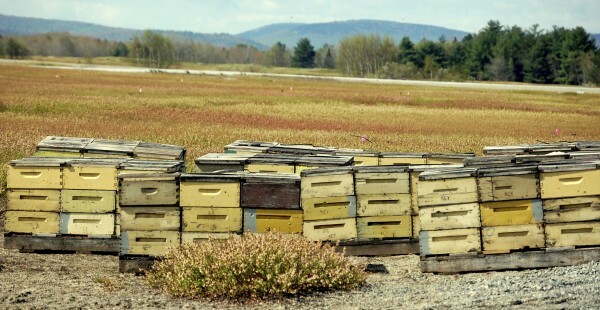 The estimated 1 billion honeybees trucked into Down East and midcoast Maine in recent weeks to pollinate the wild blueberry crop are clustered in hives within “bee yards” established throughout the region, like this one in Deblois. 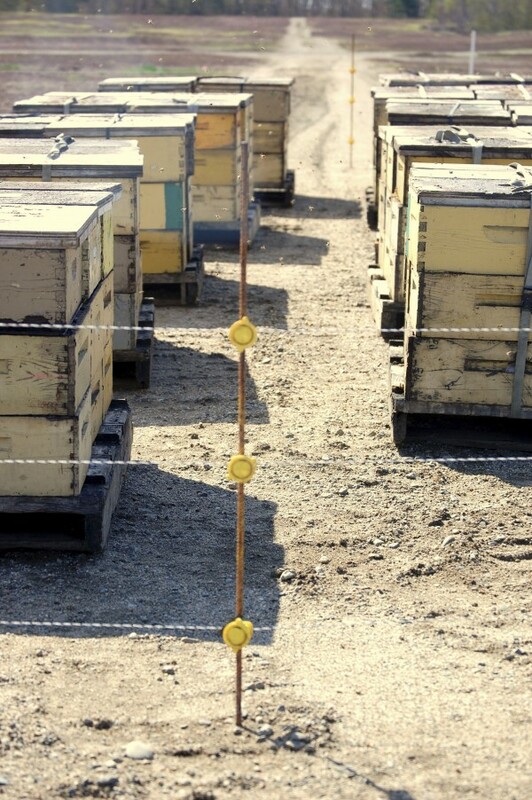 Many of the hives in Washington County that are being rented by Jasper Wyman & Son, Maine’s largest producer, are protected by electric fence to ward off hungry bears. 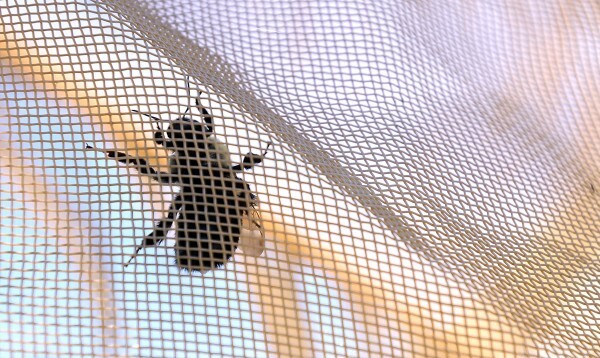 A bumblebee is seen in one of the tents Frank Drummond of the University of Maine uses in a study in Jonesboro in June 2011. 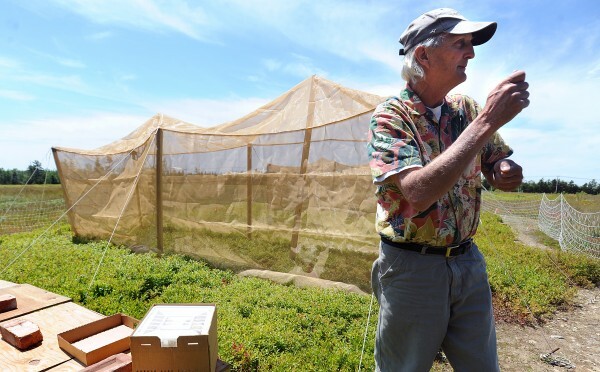 Drummond and his team release the bumblebees into tents where the blueberry plants were treated with pesticides at different times or not at all. Frank Drummond, a researcher with the University of Maine, talks in June 2011 about a study he was conducting on bumblebees in Jonesboro. DEBLOIS, Maine — The blueberry barrens of Down East Maine are literally buzzing this weekend with anticipation of a bumper crop of wild bush blueberries, given the recent importation of 1 billion honeybees trucked in from away to help ensure a hefty harvest. “No bees, no blueberries,” said David Yarborough, the University of Maine Cooperative Extension Service’s wild blueberry specialist. 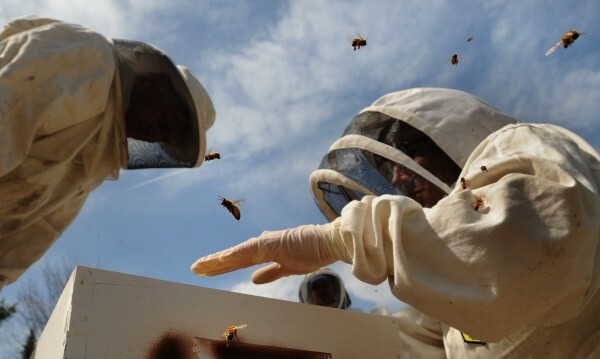 Field studies done in Washington County and elsewhere in Maine have shown that yields can be increased by as much as 1,000 pounds an acre for each hive servicing that acre, up to five hives per acre. Those results presume good weather, adequate soil moisture and good fertilization and pest management. On Thursday, the sun finally burned through three days of rain, fog and drizzle, boosting daytime temperatures in Washington County’s blueberry barrens by almost 20 degrees. Maine has 60,000 acres of blueberry barrens, with only half of those acres in production any given growing season, given a two-year cultivation cycle. Milbridge-based Jasper Wyman & Son is the largest of the six companies in Maine that process, freeze and can wild blueberries, There’s also one fresh-pack cooperative. Most of Maine’s wild blueberry fields are clustered in the Down East and midcoast regions of the state. An estimated 99 percent of all the berries harvested in Maine are frozen for use as a food ingredient. Frank Drummond is an entomologist and a blueberry pollination expert who literally wrote the book on the subject while teaching within the University of Maine Graduate Program in Ecology and Environmental Science. He notes in his magnum opus on bees and blueberries that the cost of renting hives can be a blueberry grower’s single most expensive management practice, but it also is a practice that usually results in higher yields. Lindquist said the hives Wyman’s rented this spring arrived on trucks from Florida, Louisiana, Pennsylvania and Texas. Drummond notes that timing is everything, involving factors such as weather over which growers who contract for hives have no control. Ideally, trucks loaded with pallets of hives arrive and the colonies get to work when 15 to 25 percent of the bloom is on the bush. Native bees are more productive pollinators than honeybees from away, said Drummond, who has been raising bees since he was age 13. He was recently awarded a $3.5 million federal grant to study Maine’s native bee population at 16 blueberry growing operations in Washington and Hancock counties. Existing field research, he said, has shown that a single native bumblebee is 2.3 times more efficient as a pollinator than a single honeybee from away. Native bumblebees will “work” in cold and wet weather that honeybees won’t. Having evolved in Maine over hundreds of thousands of years, interacting with lowbush wild blueberries, the natives have perfected in-flight and harvesting techniques for quickly and thoroughly extracting pollen from the wild blueberry flower. Maine’s 2011 wild blueberry harvest tipped the scales at 83.1 million pounds, according to yield results calculated by the U.S. Department of Agriculture. That was 100,000 pounds more than the 2010 crop, which the USDA estimated at 83 million pounds. While the last two crops were virtually identical in yield, prices paid to growers were up significantly in 2011, jumping from 61 cents per pound in 2010 to 85 cents per pound last year. At that price, Maine’s 2011 wild blueberry harvest was worth $70.1 million, or 42 percent more than the 2010 crop. Midcoast growers saw lower yields per acre than their Down East counterparts due to wet weather during spring pollination and a lack of rainfall during the run up to harvest in late August.